Sueño Latino is back on March 18th with two new 2016 remixes of their 1989 balearic anthem of the same name. It’s a track built around Manuel Gottsching’s masterpiece, ‘E2-E4’ that was made in Italy and cemented it’s reputation in Ibiza. “It was mid-June 1989 when Ricky Persi handed me a brand new demo which had Just been recorded with the DJs Massimino, Angelino, Gemolotto and the musician Claudio Collino. I had not planned any new releases that summer, but this track had such an amazingly fresh, now sound, that I changed my mind and decided to release it as soon as possible. The track was ‘Sueño Latino’. We mailed out a few white labels to radios and DJs and the overall response confirmed our own enthusiasm. The main radio networks included the track right away in their playlists and DJs who tested it on their dance floors received an incredibly hot reaction. A few days later, while the buzz was still growing. 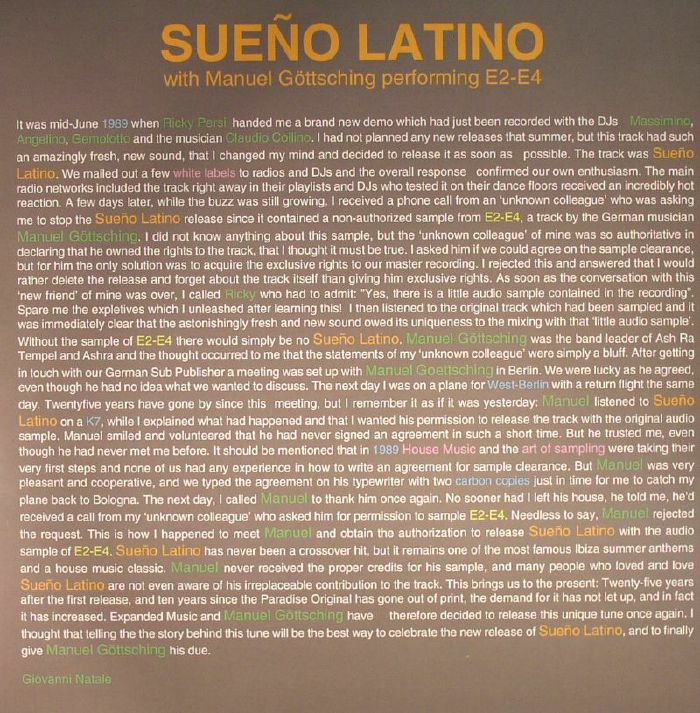 I received a phone call from an ‘unknown colleague’ who was asking me to stop the ‘Sueño Latino’ release since it contained a non-authorized sample from ‘E2-E4’, a track by the German musician Manuel Göttsching. I did not know anything about this sample, but the ‘unknown colleague’ of mine was so authoritative in declaring that he owned the rights to the track that I thought it must be true. I asked him if we could agree on the sample clearance, but for him the only solution was to acquire the exclusive rights to our master recording. I rejected this and answered that I would rather delete the release and forget about the track itself than giving him exclusive rights. As soon as the conversation with this ‘new friend’ of mine was over, I called Ricky who had to admit: “Yes, there is a little sample contained in the recording.” Spare me the expletives which I unleashed after teaming this! I then listened to the original track which had been sampled and it was immediately clear that the astonishingly fresh and new sound owed its uniqueness to the mixing with that ‘little audio sample’. Without the sample of ‘E2-E4’ there would simply be no ‘Sueño Latino’. Manuel Göttsching was the band leader of Ash Ra Tempel and Ashra and the thought occurred to me that the statements of my ‘unknown colleague’ were simply a bluff. After getting in touch with our German Sub Publisher, a meeting was set up with in Berlin. We were lucky as he agreed, even though he had no idea what we wanted to discuss. The next day I was on a plane for West Berlin with a return flight the same day. Twenty-[six] years have gone by since this meeting, but I remember it as if it was yesterday: Manuel listened to ‘Sueño Latino’ on a K7 [a cassette], while I explained what had happened and that I wanted his permission to release the track with the original audio sample. Manuel smiled and volunteered that ho had never signed an agreement in such a short time. But he trusted me, even though he had never met me before. It should be mentioned that in 1989, house music and the art of sampling were taking their very first steps and none of us had any experience in how to write an agreement for sample clearance. But Manuel was very pleasant and cooperative, and we typed the agreement on his typewriter with two carbon copies just in time for me to catch my plane back to Bologna. The next day, I called Manuel to thank him once again. No sooner had I left his house, he told me, he’d received a call from my ‘unknown colleague’ who asked him for permission to sample ‘E2-E4’. Needless to say, Manuel rejected the request. This is how I happened to meet Manuel and obtain the authorization to release ‘Sueño Latino’ with the audio sample of ‘E2-E4’. ‘Sueño Latino’ has never been a crossover hit but it remains one of the most famous Ibiza summer anthems and a house music classic. Manuel never received the proper credits for his sample and many people who loved and love ‘Sueño Latino’ are not even aware of his irreplaceable contribution to the track. This entry was tagged 2016, dfc, e2 e4, latin dream, latino, manuel gottsching, mix, sueno, synthesis. Bookmark the permalink.